Image: Courtesy of NYC Department of City Planning. Queens health club requested rezoning in order to apply for BSA special permit after operating without a valid certificate of occupancy for seventeen years. 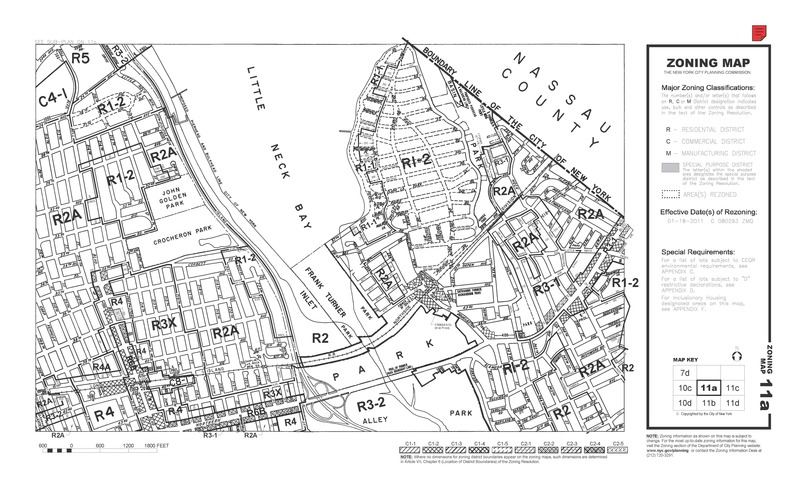 On January 18, 2011, the City Council approved Lucille Roberts Health Club’s rezoning proposal for five lots along Bell Boulevard between 42nd Avenue and the Long Island Railroad right-of-way in Bayside, Queens. The approval changed the area’s commercial overlay from C1-2 to C2-2, but left the underlying R6B zoning unchanged. Lucille Roberts has operated a gym at the site for seventeen years without a valid certificate of occupancy. The company requested the rezoning so it could apply for a special permit from BSA. The site is surrounded by a restaurant, hardware and paint stores, and a spa. Lucille Roberts began leasing a single-story building at 41-19 Bell Boulevard in 1993. The site was zoned C4-2, and Lucille Roberts applied to BSA for a special permit to operate a gym. While the application was pending, the City rezoned the area R6B/C1-2. The special permit was not available within a C1-2 commercial overlay and BSA dismissed the application. Lucille Roberts continued to operate the gym illegally. In 2004 it requested a use variance from BSA, but withdrew the application because it could not demonstrate that the gym would be the only use that would yield a reasonable economic return. Queens Community Board 11 opposed the current rezoning application as spot zoning, and expressed concern about the other use groups permitted in a C2-2 district, including auto repair shops, taxidermists, and embalmers. Queens Borough President Helen Marshall conditioned her approval on Lucille Roberts filing a restrictive declaration excluding “noxious uses” at its site. The Commission unanimously approved the proposal, finding that the new zoning would be consistent with existing nearby uses and would bring other businesses into conformance. The Commission declined to require a restrictive declaration noting that it would only be appropriate in the “rare situation” in which particular uses would result in a nuisance or be incompatible with the community. At the Council’s Zoning and Franchises Subcommittee hearing, local Council Member Daniel J. Halloran expressed his support for the rezoning as long as Lucille Roberts agreed to file a restrictive declaration limiting the uses on the property. Halloran mentioned that two other businesses in the rezoning area have been operating illegally and said Lucille Roberts should “strongly recommend” that those businesses contact his office. Council: Bell Boulevard Rezoning (C080293 ZMQ – rezoning) (Jan. 18, 2011).